Stroke is the fifth-leading cause of death in the United States, killing nearly 129,000 people each year. Stroke is also the country’s leading cause of adult disability. The good news is that these numbers are decreasing. Only a few years ago, the American Stroke Association reported that stroke was the third cause of death in women and the fourth cause of death in men. And over the past decade, the death rate has decreased 34 percent and the number of stroke deaths has dropped about 18 percent, changes the organization attributes to public education efforts and the development of new technologies and techniques to treat stroke. One treatment that has had a significant effect on stroke-related death and disability is a procedure called mechanical thrombectomy, which uses a stent-on-wire, also known as a “stroke stent” or “stentriever.” While still relatively new, Carilion Clinic has been conducting this procedure since it gained FDA approval in 2012. According to Carilion Clinic interventional neuroradiologist Biraj M. Patel, M.D., the trend in stroke treatment is toward endovascular mechanical thrombectomy, both nationally and in our region. “There has been a swing in the pendulum toward endovascular therapy since the data released at the International Stroke Conference in February 2015 showed efficacy of endovascular treatment +/- IV tPA (clot-buster) versus clot-buster alone in a selected group of patients,” said Dr. Patel. The procedure allows interventionalists to manually extract a clot quickly using catheters and a stroke stent. “We put a cage-like device that is on a wire that’s deployed across the clot to incorporate it," he explained. "Next, a bigger catheter is brought to the clot and that catheter is used to essentially extract the clot with the device as a unit. With new technology and devices and improved techniques over the years we are able to recanalize—or unblock and restore blood flow—for more and more patients." Dr. Patel reports that for every 100 patients treated, about 40 will have a better functional outcome at three months, including 25 more who achieve functional independence when followed up long-term. Download, share and print this image to help spread the word. And remember that that last item is the most important. 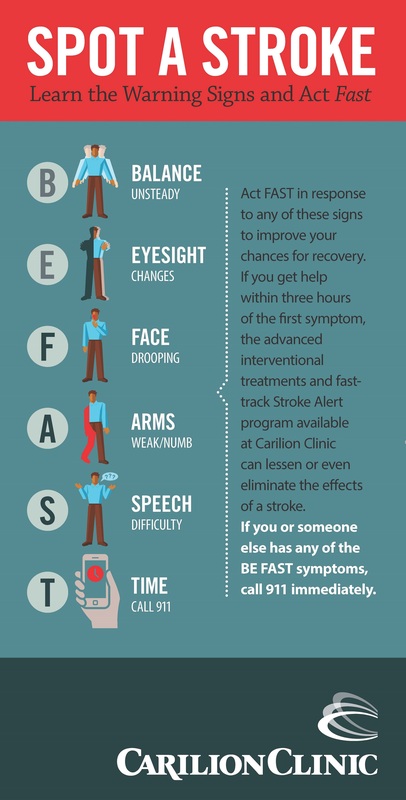 If you or someone near you displays the symptoms of a stroke, call 911 right away. You just might be saving a life!